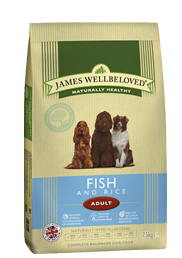 The delightful fresh taste of Ocean White Fish & Rice is one that dogs love. Low in histamine, white fish is also high in omega 3 fatty acids which are vital for maintenance of optimum health. The necessary dietary fibre is provided by peas and chicory, something different for our Ocean White Fish & Rice diet. And olive oil is not only delicious, but also has a high mono-unsaturate content compared to other oils, and is well known as part of the healthy Mediterranean diet. Ingredients: Rice, ocean white fish meal, barley, whole linseed, vegetable gravy, olive oil, peas, fish oil, alfalfa, sodium chloride, natural seaweed, chicory pulp, calcium carbonate, chicory extract, lysine, DL-methionine, yucca extract, threonine, JWB special ingredients. Contains: Min 23% fish, min 28% rice, min 15% barley. Typical analysis: Protein 21%, oil 10%, fibre 4%, ash 8%, omega-3 fatty acids 2.1%, omega-6 fatty acids 1.4%.